Try a new take on a crescent roll ring with this Easy Baked Cheese & Vegetable Twist. 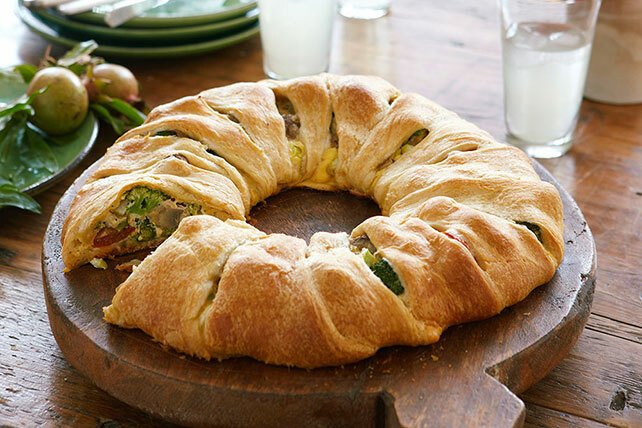 This crescent roll ring recipe will be a hit at your holiday party. Mix first 3 ingredients in large bowl until blended. Stir in next 4 ingredients. Unroll crescent dough; separate into 16 triangles. Arrange in 11-inch circle on foil-covered baking sheet, with short sides of triangles overlapping in center and points of triangles toward outside. (There should be a 5-inch-diameter opening in center of circle.) Spoon cheese mixture onto dough near center of circle. Bring outside points of triangles up over filling, then tuck under dough in center of ring to cover filling. Bake 35 to 40 min. or until crust is golden brown and filling is heated through. Top with additional 1/2 cup shredded cheese before baking as directed.